Okay. So, yesterday went well. I was not “hungry” per se, but I was missing chewing and the act of eating. Anyway, I got through it. Last night was my first visit back to Planet Fitness in ages. Well, in ten days; but it felt like ages. Nothing was “hard” like when you’ve stopped exercising for six months and you’re just starting up again, but I had little to no energy stores. I walked / jogged 1.27 miles in 26:15 minutes. Yes, I know. Most people walk faster than that. The truth is sometimes I do, too. Rarely, but sometimes. Anyway, it felt like I was in molasses. I was okay for my 2 minute warm-up walk, but as soon as I started to jog – forgetaboutit. So, I had to alternate slogging and walking to get through it. One interesting point: My face is already starting to get the “oily / waxy”, moist feeling on my forehead, nose and cheeks. This normally happens around day 6 or 7. I don’t know why it seems to be happening sooner than “normal”. At first, I used to worry about acne when this started, but in all of my fasts (long and short over a dozen in my life), it has never ended up causing a breakout of acne. Actually, I find it kind of makes my face look younger – smoother and better hydrated. So, that’s a good thing. 2014 We Are Not A Fearful Nation! Today is the last day of my first year of retirement! 1) You need more money up front than you think. Because of the way Social Security, retirement plans and private savings are set up, there is a “substantial” delay between when you retire and when you start getting your money on a regular basis. In my case, I couldn’t make up my mind how much to draw down my personal / private savings until after I got my final payment figure from SSA. This meant pulling in our belts more than expected (for a few months) until I felt comfortable making this decision – and then waiting for it to kick in and start paying. Everyone’s situation will be different, but I saved four months of “working” net pay to cover the expenses and I probably would have been more comfortable if I had been able to save up six. 2) Make sure you can cover your health care expenses! This out of pocket expense has been significantly more than I estimated. I made sure to cover the cost of insurance and prescriptions and a “normal” amount of routine visits. I didn’t “really” budget for trips to the ER, colonoscopies, cancer surgeries, … and the list goes on. This will remain a cost I will have to constantly monitor until we get a “real” national healthcare system which covers medical, dental and vision. You know – all of “health”. For us, this probably means Medicare when we turn 65 in a couple of years. 3) You need to get organized and then try to stick with a flexible plan. Even with all day, every day, if you aren’t eating the elephant one bite at a time, big jobs on the “honey-do” list will get away from you. Most stuff is day to day, but you need to allocate time to longer term goals and what you want accomplished or they will drift and just not get done. 4) It always ends up being more complicated than what / how you learn to do it on YouTube. And usually more expensive, too… Sometimes, you’ve just got to bite the bullet and pay a professional. Do your retirement budget a favor and pay to get it done before you retire. 5) It takes longer to adjust to a “non-work” schedule than you think. I thought my body would adapt to a different sleep pattern within a couple of weeks. WRONG. It’s been twelve months and I’m still adjusting. Sure, I can stay up later now, but that doesn’t get things done the following morning when you sleep in to make up for it. 7) Relax, smell the roses, and have a cuppa’… About six weeks into my retirement (last November), I had to go into the ER / hospital to get my heart stopped and restarted due to my AFib. So, once again I’ve been reminded I’m living on borrowed time. (Hence the more sleep and trying to lose weight.) It felt so un-natural to not have to get up for work, I think I let that (by itself) stress me out. Now, I really am trying to take it a bit easier and settle into “being” retired. LOL… I think it might take me another two or three years, but I’m determined to get better at it. 2017 First Day Of Retirement! 2010 Insubordination… And That’s Why I Love Her! The struggle is a normal, necessary part of the process. Changing your food is hard. Changing your habits is even harder. Changing your relationship with food is the hardest part of all. The process requires struggle — it’s how you know you’re growing — but don’t make it harder than it has to be! There is no such thing as the ‘perfect Whole30,’ so if your beef isn’t grass-fed or your travel meal doesn’t look exactly like our meal template, don’t sweat it. Your only job is to stick to the Whole30 rules for 30 days, and some days, you’ll have to let good enough be good enough. When you do struggle, remember why you took on the program in the first place, and don’t be overwhelmed by the big picture — just focus on the next day, or the next meal. Don’t be afraid to ask for help when you need it, and high-five yourself for the victories you’re achieving every day you’re on the program, no matter how small. Even tiny progress is progress. 2013 Smile From Your Heart! Energy waves strike the stone, which begins to crack. The stone crumbles into tiny pieces. 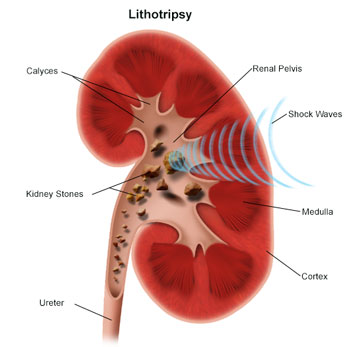 • You get medicine to prevent pain and help you relax or sleep during lithotripsy. Once this takes effect, the procedure will start. • A flexible tube (stent) with holes in it may be placed into your ureter, the tube that connects the kidney and the bladder. This helps keep urine flowing from the kidney. • Your healthcare provider then uses X-ray or ultrasound to find the exact location of the kidney stone. • Sound waves are aimed at the stone and sent at high speed. If you’re awake, you may feel a tapping as they pass through your body. • You’ll be closely watched in a recovery room for about 1 to 3 hours. Antibiotics and pain medicine may be prescribed before you leave. • You’ll have a follow-up visit in a few weeks. If you received a stent, it will be removed. Your healthcare provider will also check for pieces of stone. If large pieces remain, you may need a second lithotripsy or another procedure. • Your urine may be cloudy or slightly bloody. You may even see small pieces of stone. • You may have a slight fever and some pain. Take prescribed or over-the-counter pain medicine as instructed by your healthcare provider. • You may be asked to strain your urine to collect some stone particles. These will be studied in the lab. A big shout-out to the office staff, nurses and doctors at John Muir Hospital – Concord, CA, campus! You were all terrific and I felt VERY well cared for! Just a side note: my weight at the hospital yesterday was 332lbs. My weight today (at the hospital) was 330lbs. 2lbs difference. My weight at home yesterday was: 325lbs. Today it was 324lbs. A 1lb difference. I was wearing virtually the same clothes (shoes, shorts and underwear). I was wearing a change of underwear, but they were the same types of briefs and V-neck T-shirts. I just thought this was “interesting”. The start of day forty-three… And I only made it to noon. I am still down “54/61”. As in, 54lbs down from my fasting start weight: 373lbs, and 61lbs down from my highest weight ever (two days before I started Juice Fast I): 380lbs. Today’s weight is no change from yesterday when I gained 4lbs from my cheat evening (the night before). Considering yesterday was the first day I EVER registered over 20 miles in steps (over 45K steps) on my FitBit, I was hoping for some kind of decrease. But, it was not to be. In all honesty, while not bloated, I do feel like I’m still retaining fluids from the cheat. Which is what should happen when you suddenly re-introduce salt and / or sugar into your system. I did both on Thursday evening. I guess I just wasn’t able to clear them out enough to register a loss by this morning. Reaction: I have two main reactions, 1) I feel 10 years younger, and, 2) this evening, after my dinner, as I am writing this, I feel slightly bloated. I did NOT end according to plan. The plan was to spend six(6) days easing back into food. I definitely have NOT done that! I’ve jumped back in with a big salad for lunch and another big salad for dinner. For dinner, I also had a sausage, a half cup of rice and a cup of pinto beans. And I washed it down with 24 ounces of water with lemon slices which had been sitting for 24 hours. When I say “slightly bloated”, it’s my tummy which is just full enough that I am not hungry, but I’m not stuffed either. Other notes: I’ve gone from a 54 inch waist to a 48 inch waist. I’ve gone from barely being able to touch my two middle fingers behind my back to being able to grab either opposite wrist with the other hand (again, behind the back). I am comfortable doing 5 to 7 laps (5×25 yards) in the local swimming pool in a nice slow breast stroke with minimal stopping time between turn-arounds. At the start, I could barely do one lap. So, what’s next? Well, this week we are planning to join Costco. While it is a little farther away and less convenient than Safeway, we believe we’ll be able to get a healthier selection of fruits and veggies at a more reasonable cost (even though we will have to buy substantially more at one time). That’s takes care of the “sourcing”. But, what’s the plan, you say? We are currently planning on a modified Dr. Fuhrman, “Eat To Live” two-week plan. Week One is hard diet (no meat) and week two is the softer (slower weight-loss) diet (meat is included). We are flipping the weeks to start: soft and then hard; and then we plan to re-cycle through. My wife will have whatever she wants since she is not strictly joining me on the diet. She says she will try to stay with me, but no promises. I said that’s fine. Every dinner will be a large fresh salad, a half cup of rice and a cup of beans. We may also have an optional cooked vegetable depending on her mood. We may also have optional flesh: meat, poultry or fish. I can only have 4oz of flesh at any meal. In lieu of “flesh”, if she is making something else for her meal (usually a pasta and chicken dish), I can have a half cup of that. Lunch will be a medium salad, a half cup of rice, and a cup of beans. There may also be “something” for a change. We are not sure what those somethings will be, but we are leaning towards veggie-patties or maybe a bean / beef / oats burger. Again, the bulk of any meal should come from the salad and the beans. I like pinto beans (because that’s what I was raised on), but we will alternate / rotate with black-eyed beans and kidney beans. We will try to keep the salad different by using the various dressing recipes Dr. Fuhrman provides in his book. Breakfast will primarily be oatmeal made with water or almond milk. I will add fruit (dates, blueberries, black berries, strawberries and raisins) and nuts (walnuts and / or almonds) instead of sugar. I will alternate that with the occasional fruit bowl (melon / mango / strawberries / other berries). Snacks: My go to snacks will be fresh fruits (apples and bananas or whatever is seasonal), nuts (walnuts, almonds or cashews), or raw veggies (mainly celery and carrots). Fluids: I will also use fruit and veggie juices for snacks. I will try to drink at least 32oz of water (with a little lemon concentrate) – for my kidney stones, cranberry and pomegranate (again for my kidneys), and black cherry juice (for my arthritis). I will occasionally also make veggie juices for between meals and for evenings. Finally, cheats: I am not “planning” a cheat schedule (yet), but I understand human frailty – particularly my own – so I fully expect a “small” cheat once a week or so and a “large” cheat once a month or so. I expect this will work out over time and will depend on how much I’m losing and how eliminating salt and sugar from my diet progresses. I do not feel I can / should completely eliminate salt, because I will still need iodine and electrolytes, but I am going to try really hard to minimize the sugars. We’ll see… Day by day. Keep me in your thoughts and prayers. Namaste! The start of Juice Fast II… Day 1. I am now down “54/61”. As in, 54lbs down from my fasting start weight: 373lbs, and 61lbs down from my highest weight ever (two days before I started Juice Fast I): 380lbs. Today’s weight is a 4lbs increase from yesterday’s 315lbs. My prediction after my “cheat” yesterday (gain 3lbs) was almost correct. Today would have been the end of day 42 (6 weeks!) of my juice fast except for my cheat yesterday afternoon / evening. When I got up, I decided to try to make it a hiccup and just start over. The immediate goal remains the same: day by day veggie juice fast with the current short term goal of 310lbs and a medium term goal of 299lbs. At the moment, the plan is to stop the juice fast at 310lbs and diet to (and beyond) 299lbs. The real goal remains to change my relationship with food and to get healthier by both a better diet (eating plan – NOT continuous dieting) and to vary my activities to be more active. To modify the old weight loss axiom: I need to “eat better and move more“. If there is a silver lining to this “hiccup” it is there is no more need to count each day from the middle of the day. I started “today” when I woke up. He shaved them off but they grew back in again. 2013 May I Have A Little More, Please?